Rachel Lyndhurst: A bundle of billionaires - Entangled Indulgence omnibus releases today! A bundle of billionaires - Entangled Indulgence omnibus releases today! 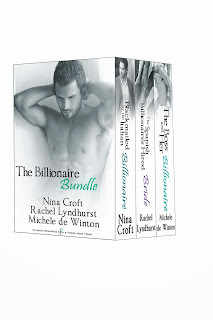 Teamed up with two other mind-blowingly alpha billionaires from Michelle De Winton and Nina Croft, Entangled Publishing presents The Billionaire Bundle. A convenient triple bill starring The Spanish Billionaire's Hired Bride, The Boss and Her Billionaire and Blackmailed by the Italian Billionaire, there's plenty of sunshine, glamour, intrigue and romance to keep you enthralled for some time. And you deserve some total indulgence, don't you? Or maybe someone close to you does. I wonder if the Duchess of Cambridge would like a copy to lie in the bath with while Wills does his bit for a few hours? Catherine, if you would, just drop me a line! To celebrate, Nina, Michelle and I have arranged for a fun giveaway that should add some November sparkle as well. How do you like the sound of Monopoly Millionaire, chocolate gold coins, a $10 (or GBP equivalent) amazon gift card as well as one digital back list title from each author? Just enter below to have a chance of winning and the giveaway ends on November 18th , so get cracking!! The Billionaire Bundle eBook will be available just about everywhere, but here are some instant links for you and I'll add the amazon.co.uk link when it goes live.